Yet another post that is inspired by my trip up to Big Bear Lake this past weekend. When I decided to take this weekend trip I knew it was so that I could write and not be distracted. So for the first thirty minutes or so on the hike Saturday morning I was wracking my brain for ideas on posts. Have you ever heard the term “trying to squeeze blood from a stone”…? You just can’t do it! After the first half mile I decided that over thinking was the opposite reason that I had come here in the first place, so I decided to just enjoy the beauty around me and try to shut my brain down. This is not an easy task so it took yet another half mile to accomplish this. For most of the hike I was able to simply admire the scenery, breathe in the pine scented fresh air, and just enjoy being transported back to my childhood when my family would spend weeks in Yosemite camping, hiking, and fishing. On the way back down to the trailhead I finally let my mind wander and pull ideas from the hike I had just taken. When I was little my family would take countless hikes in Yosemite. Each one of these had a beginning and an end point (endpoint being a lake where we were hiking to so that we could fish.) Each time we would head off on these hikes, my brother and I would have an unspoken competition on who could get to the “end point” first. My brother has always been one of my biggest heroes and simultaneously one of my biggest rivals. At one point my Dad had to start carrying my fishing pole for me because I almost snapped a brand new one while racing up a trail in an attempt to beat my big brother. Do I look back and realize I these may have been childish competitions? Yes. Does this stop us from engaging in these types of competitions to this day? Nope. The point of this wonderfully boring “extra special glimpse” into my life is that there have always been “end points” that I’ve focused on and raced towards. 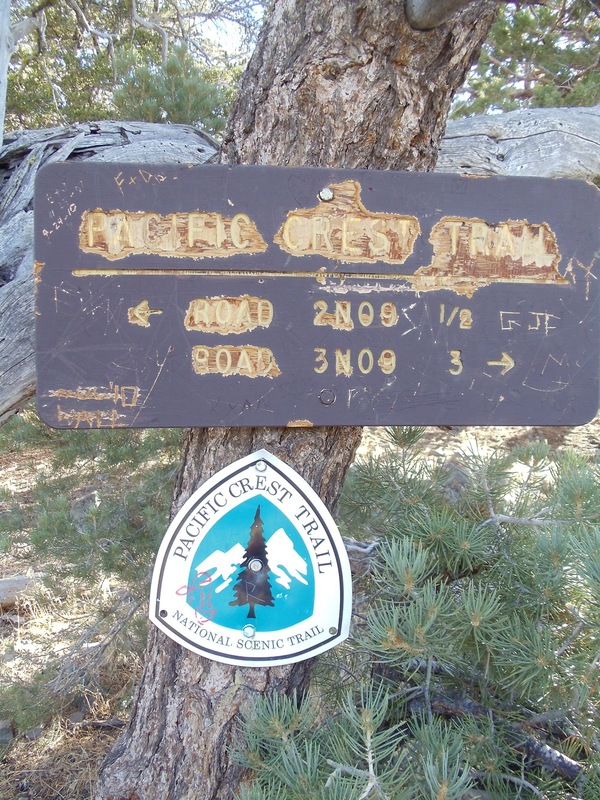 This past weekend I took a trail that I knew had an end point, but that also transected the Pacific Crest Trail that goes from Mexico to Canada. I planned on taking that for a couple/few miles until I felt like turning back. In other words, there was no definitive “end point” to this hike. I decided I would go until I either felt like I had gone far enough, or had let myself succumb to the fear of a mountain lion tracking a sole hiker and was waiting for a moment of weakness and unawareness to pounce and make a tasty meal of me. As highly ambitious females we are always setting and focusing on goals and “end points.” Often times the journey we take or the course we follow to get to these goals is brushed aside and barely remarked upon. I look back at the years and years my family spent in Yosemite, hiking through some of the most beautiful areas in California, and I regret the race I always took to the top. How many moments of peace and happiness did I pass up on by ignoring my surroundings, focusing on the ground beneath me, and the goal I was racing towards? In a recent interview from my mentor (Jeremy) he stated that, to date, his most rewarding experience in his career was the two years he spent leading his team in what would ultimately earn him the promotion to area Vice President. Notice that he did NOT say his most rewarding experience was the actual promotion, nor was it his title which helped him land the position he now holds, but the JOURNEY with his team that he so fondly looks back on. As I was hiking back to my car I realized that throughout the course of the hike my primary focus was on the scenery, the experience, the simplicity of putting one foot in front of the other and the joy that each moment brought. Not once did I think about racing to that goal I had set, because there was no goal on this hike (well…that isn’t entirely true. One of my goals was to avoid being eaten by a mountain lion so I guess that was achieved.) I was going to keep going until I felt like turning back. Ladies, how often do we set goals for ourselves? Whether they are personal or career related? And how often do we become so singularily focused on those goals that we forget to appreciate the journey we take to achieve them? How many of life’s lessons do we miss out on because we were racing so quickly (breaking fishing poles, tripping, and not making eye contact with those that passed by us) that we missed experiences that could have given us a whole new perspective or outlook on the goal we were making such huge strides towards? What if, for a change, we set “land markers” to keep us on track and focused, we’d be aware of the lessons we were learning on our journey, and when we reached the end point we’d then head back, to rest, recoup, and plan the next adventure?